The first day of the 2014 University of Alabama System Scholars Institute is in the history books and I’m thinking the tips on how to use social media to enhance our academic mission have been the most memorable and most useful of the Institute. Monday a team of faculty and staff from the second largest college here on the Tuscaloosa campus presented what I considered the best panel of the day. But, a faculty member in my own College of Communication and Information Sciences, also shared some ways platforms such as Instagram and Tumblr can be integrated in our teaching and learning model. 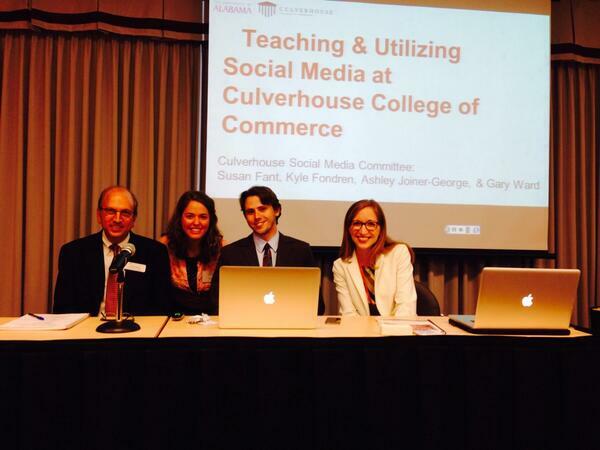 In talking about “Teaching and Utilizing Social Media at Culverhouse College of Commerce,” Gary Ward, Kyle Fondren, Susan Fant and Ashley Joiner-George, offered a template for any academic unit to use no matter what discipline. 28-year-old Fondren utilized his youth to make a compelling argument for why Twitter is essentially a must for an academic institution in communicating with its constituencies. In outlining the “pipeline approach” that his College uses with a main Twitter handle, @culverhouse, Fondren shared a little bit about his own news consumption habits, something of particular interest to those of us in the field of journalism. Fondren also made it clear why he’s the web content coordinator for Culverhouse College of Commerce and Business Administration. Full disclosure: Fondren is a graduate of the UA journalism program, where I am a member of the faculty. What he brought in youth, Ward brought in experience of years as the leader of the Career Services unit. The audience for the Scholars Institute is a mix of professor-types whose primary focus is our teaching and research and technology support personnel who help us do what we do. There are also a fair number of administrators from the three campuses who attend. This panel touched all three constituencies. Most of our conversations at the Scholars Institute tend to be focused on what we’re providing and delivering for our current students. The panel from Culverhouse made a key point about the role of social media in maintaining relationships with one’s alumni, an important role for any academic unit. One of the best points of the panel was made by Ward as director of Graduate Career Services. He stressed the importance of recognizing the aging demographic on Facebook, compared to those using other social media outlets. Those ‘older folks’ still are very important when it comes to influencing a young person’s decision about where to go to College or making a donation to one’s alma mater. One of the biggest lessons I learned from this presentation is how much C&BA Dean Michael Hardin and Manderson Associate Dean Brian Gray have become leaders in their use of Twitter. They’re setting the tone for other peer business schools around the region. We all want to do that in our respective fields. But, it takes a commitment from the top administration and administrators willing to “model” such a commitment in their own everyday work. 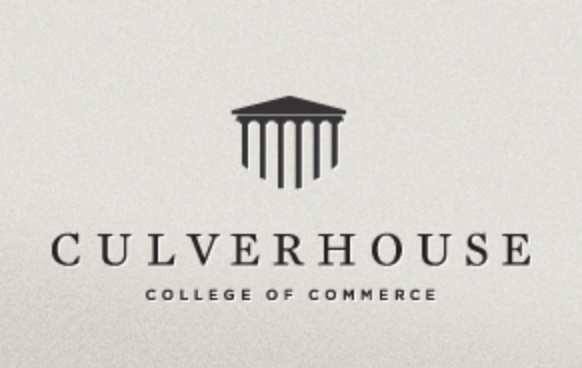 None of us who are talking about the technologies we’re using have “arrived.” The Culverhouse team are just finishing their first year of offering Digital and Social Media Marketing class as a part of its Masters of Science in Marketing degree. Meanwhile, the C&BA administrators (and faculty) who are tweeting are still slowing building their Twitter following. They’re sharing lessons they’re learning as they are learning them. 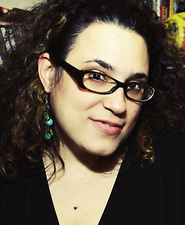 Also Monday, Rachel Raimist, an assistant professor in the UA Department of Telecommunication and Film, did a solo presentation on her use of social media in two travel courses designed to socialize University of Alabama film students into the world of film festivals and the Hollywood scene. One of the few UA faculty effectively using the relatively new “Winterim” three- week term as a teaching period, Raimist has offered her “TCF at Sundance” class twiee. Her talk Monday was less about how to get students acclimated to the Sundance Film Festival, and more about how the structure a teaching and learning experience with such platforms as Tumblr, Instagram and yes, Facebook. All three also have a place in her upcoming 8-week “TCF in Los Angeles” travel course that will run again in June and July. Still digesting much of what she had to say.